The research in the Mental Imagery lab focuses on investigating visualization processes and individual differences in mental imagery in cognitive style. In particular, we examine how individual differences in visualization ability affect more complex activities, such as spatial navigation, learning and problem solving in mathematics, science and art. We also explore ways to train visual-object and visual-spatial imagery skills and design three-dimensional immersive virtual environments that can accommodate individual differences and learning styles. Our approach integrates qualitative and quantitative behavioral research methods, as well as neuroimaging techniques (EEG, fMRI). Furthermore, we develop and validate assessment and training paradigms for visualization ability, using 3D immersive virtual reality. Based on behavioral and neuroscience evidence, we formulated a theoretical framework of individual differences in visual imagery, and suggested that visualization ability is not a single undifferentiated construct, but rather is divided into two main dimensions: object and spatial, and that the spatial dimension is further divided into allocentric and egocentric dimensions. 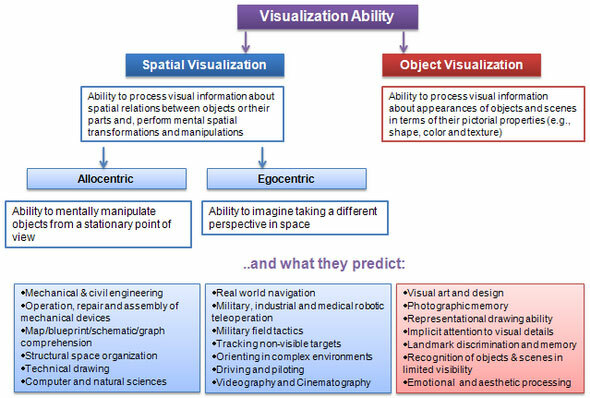 All these visualization abilities underlie success at different complex, real-world tasks, and predict specialization in different professional and academic domains.